First, I made circles with the numbers 1 through 10 in them. It was really easy to do in Microsoft Word, but depending on your child's age and ability level, you could have them trace the bottom of a glass or another round object, and write the numbers in the circles. You could also use patterned papers or have the kids paint a piece of paper first, to cut the circles out of. I also made an oval for the head. 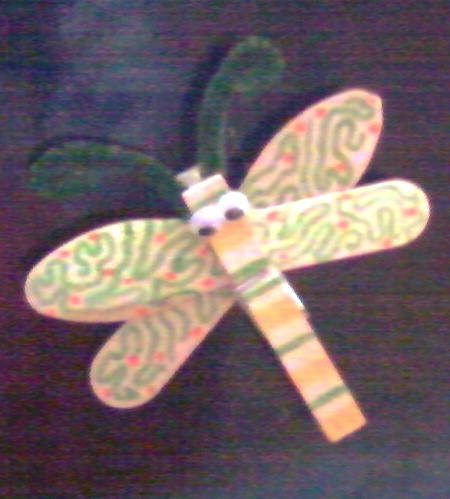 On Wednesday, we made these cute dragonflies. To make some, just color two wooden craft spoons and a clothespin with markers. I suppose you could also paint, but it's easier for little hands to add detail with markers. Then cross the spoons and insert them in the clothespin as shown in the picture. I used hot glue to make sure they were really secure. We added pipe cleaner antennae and googly eyes, plus a self-adhesive magnet on the back, so they can hang on the fridge, or, as in our case, the dishwasher because the fridge is already full of fun projects. 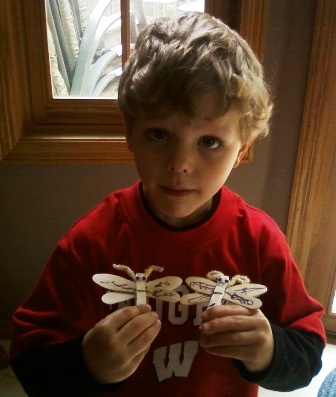 (Sorry about the poor quality of the dragonfly pics--Hubby had the real camera somewhere, so I used the one on my phone). I do love the way the eyes "bug out", so to speak! The next day Pal was with us, we pretended to be spiders, but I didn't get any pictures, and spiders aren't insects, anyway. 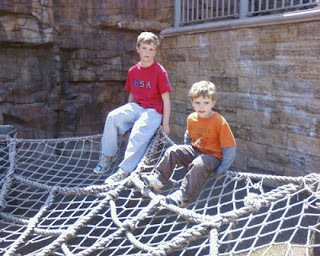 Here's a consolation pic of MC and Bubby hangin' on the spider-web the last time we pretended we were spiders (also from my phone camera). To extend the learning, you could talk about insect life-cycles and/or bug characteristics or visit your local library to borrow books about bugs. Oh, and of course, observe some real ones :) Have fun! MC tested for his gold belt a couple weeks ago. Now he's a gold belt! This is his "mean face." I don't know about bad guys, but I find it intimidating. After receiving his gold belt, MC headed over to the year-end Cub Scout camp-out. and now he's working toward Bear. I am feeling out-of-proportionally stressed about this costume issue. Should I make the wolf costume because I can and that's what my kid wants? Or should I admit to myself that it's just too much right now and try to explain about priorities and limited resources (which in this case is time and energy) to my child, and have him choose from the tiger, dog, turtle, or frog costumes that we already have? I'm fairly sure his teacher did not mean for this assignment to become an exercise in parenting philosophy, and I'm positive she wouldn't want me to stress about it, and yet, here I am...Argh! The problem is, I feel like if I decide not to make the wolf costume, it's more because I just don't want to, and not having the time is just an excuse. And that makes the mommy guilt start gushing. Because I really do have the time, it's just that using time for this project will cause other tasks, for which I have already allotted time, to be squished, which causes...stress. Note to all future teachers of my children: any costumes that you require of my children must be for humans. Furthermore, they must be humans who dress in normal, every-day clothing that my children already have in their closets. Thank you. Now. Off to check Amazon for a compromise. I said before I was fairly sure Ms. R didn't mean for this assignment to become an exercise in parenting philosophy, but I am pretty certain that she did mean for it to be an opportunity for learning. She probably didn't realize, though, that the kid was going to learn about priorities and limited resources, or that the mommy was going to be learning something, too. Well done, Ms. R. Well done. So I just read this book, Plain Wisdom: An Invitation into an Amish Home and the Hearts of Two Women, and I think I liked it. The authors are Miriam Flaud, an Amish woman, and Cindy Woodsmall, an Englischer (aka someone who isn't Amish). The book is a collection of anecdotes: stories from the women's lives and truths that they've learned through their experiences. Each of the authors writes, from her perspective, on a connecting theme, with scripture to tie it all together. The stories are actually a lot like the experiences and insights I share on my blog. I say I think I liked it, because I didn't, at first. I don't think I quite "got it": it wasn't quite what I expected, but, after a few chapters, I just devoured the book. Really. I read it in 2 days (which is really saying something considering I've got a busy family to care for). It's a very quick read--the chapters are, at most, 3-4 pages long, so it really is something that you can just pick up and read for 5 minutes and come to a good stopping place, and for that reason I would say it's a good summer vacation read. One of the stories that really resonated with me from the book is from the chapter entitled "The Flip Side." Cindy was talking about a time when she was upset with her husband. She wrote, "if he were always right, [I'd] be the only one in the relationship who was ever wrong." Think about that, ladies: what would it really be like to live with a perfect husband? Because we all know that we are far from perfect and in need of some grace and understanding from time to time! Each of the chapters contains nuggets of insight like that. I loved the little peek into the Amish lifestyle that Miriam provided, as well as the recipes she shared, including (you guessed it) Amish Friendship Bread (it is no longer true that the Amish are the only ones who know how to make the starter!) What's really remarkable to me is that, while these two women, on the surface, appear to have nothing in common, through their writings we learn just how similar they are, and actually how much we all, as women, as humans, have in common. Near the end of the book, Cindy shares, "we simply wanted to tell our experiences--the tough, fun, encouraging, disappointing, and embarrassing moments--so they might instill a sense of hope, victory, and humor into our readers' days." And that's exactly what Cindy and Miriam have accomplished in Plain Wisdom. So I thought I'd let you all know about a pretty good deal on baby wipes from Amazon.com. Now, you can definitely get better deals than this with coupons and waiting for the right sale, but this price is better than regular price at the store, and you don't have to leave home to get it! So here's what you do: go here for Unscented Pampers Thickcare 7x Wipes or here for Scented Pampers Thickcare 7x Wipes. Scroll down a bit and you'll see a 50 cent coupon. Click on "Clip this Coupon," and it will automatically be applied to your order at check-out. Next, just above the coupon you'll see a box that says: "Save an extra 30% with Subscribe & Save and Amazon Mom. " If you're not already a member of Amazon Mom, click on "Join Now". By the way, Amazon Mom is for anyone who cares for a child, not just for moms (or actually anyone, since they don't require proof that there's a child in your life). It's free to join and there's no obligation whatsoever (click here for more information about Amazon Mom). And remember, with subscribe and save, you can cancel your subscription at any time (click here for my cliff notes explanation of Subscribe and Save or here for even more information about Subscribe & Save). Next, add the wipes to your shopping cart using the Subscribe & Save option. The price for Amazon Mom with subscribe and save and the coupon will be $9.29, shipped, for 504 wipes, which is less than 2 cents per wipe. This particular style is nice and thick, and soft, like a washcloth, and I love that you get 7 individual travel packs, with reclosable plastic lids, so you can take them with you, and you don't need a bulky tub to put them in. We are, thankfully, beyond needing baby wipes to wipe baby bottoms, but I like to keep a pack in each of our vehicles and we take them camping as well, not to mention doing quick clean-ups of paint covered hands! ﻿After what seemed like a solid week of rain and cold temperatures, I was a little nervous about what the weather would hold for our planned trip to Hugo Animal Farm on Monday, but the day was perfect for our little road trip: sunny and warm. But before we headed out to see the animals, we spent a couple of weeks making farm animal art projects. I've already posted about our handprint cows, ducks, and sheep. We also put together a barnyard full of clothespin-legged farm animals to play with. This idea came from First Palette--it was so easy and fun! I just downloaded the printable template and the kids colored the animal shapes with crayons. Then I cut them out, the kids glued the shapes back to back and we added clothespin legs. I tried to get the kids to paint or color the clothespins, but that was a no go--the animals ended up looking pretty good, anyway. On another day, we put together these cute fences using tongue depressors. I had thoughts of making a barn out of a box covered with red paper, and I have an empty oatmeal box waiting to be turned into a silo, but I'm not too sure either of those will ever come to be. So, after practicing with our play animals, we headed out to feed and pet some real ones. We saw ducks, turkeys, geese, chicks, chickens that lay blue(!) eggs, pigs, goats, sheep, rabbits, puppies, kittens, horses, and cows. Here's Pal petting a 3 week old piglet. By the end of the tour Bubby was willing to hold this 3-day old chick. Look at this big tractor! We also went on a hay ride, jumped into a big pile o' hay, and explored several fun barns. We stopped at a playground on the way home for lunch. What a fun and gorgeous day! Bubby learned to pedal his new bike, which is more difficult than it sounds because it has back-pedal brakes. Subsequently, taking his cue from his brothers, Bubby learned to ride his new bike one handed. Sawblock and Code-man placed 1st and 2nd in their divisions in a Buttercup Series kayak race, which is, apparently, a qualifying race for the Junior Olympic kayak trials (when Sawblock told me they're held in Golden in September, I immediately began making plans to attend). Three of my favorite people/stuffed dogs up-side down. You probably thought, since Lent is over and all, that we were done with these "today I choose" posts, and yet, here we are, one more. I meant to post this much closer to the conclusion of Lent, say, the day before Easter, or maybe the day after, but, well...it didn't happen. I wasn't perfect in my choices. In fact, some days I failed miserably, and all I had was my stated intention. But through it all, I was able to catch glimpses of a life lived to the fullest, unfettered by human restrictions; glimpses of the kingdom of God drew near in those moments that I lived my choices, and it. is. beautiful. And so today...today, I choose Jesus, as surely as Jesus has chosen the cross, as surely as Jesus has chosen me. Today I choose a life lived in Jesus. All of those other choices, they were all about Jesus: about living in freedom, the way I was created to live. And you know, it is good that I didn't get this posted when I intended, because, my friends, every day, not just Easter, is a good day to choose Jesus. Every day is a day I need to choose Jesus. I've wanted to read Bad Girls of the Bible: And What We Can Learn from Them by Liz Curtis Higgs, ever since I ran across it while searching for a study to do with my women's group. The group has never quite gotten around to it, so I was thrilled when I was offered a copy for review. Liz starts the book off with Eve, "the first bad girl," and explores the stories of nine other women, whom she has classified as "bad to the bone," like Jezebel; "bad for a moment," like Lot's wife; or "bad for a season, but not forever," like Rahab. Each chapter begins with a short, contemporary, fictional retelling of the story, followed by a verse by verse exploration of each bad girl's story as told in the Bible. Liz finishes each chapter by pointing out several lessons we can learn from each bad girl's story, and lists questions for private reflection or group discussion. This format was absolutely perfect for me. I have a hard time staying focused and engaged long enough to read an entire non-fiction book, but the short interludes of fiction were just enough to keep me interested and engaged. I also love Higgs' witty, honest, and down to earth girlfriend-to-girlfriend writing style. She definitely makes the material easy to understand and is skilled at highlighting each story's relevance. Also included is a study guide to assist group leaders. Each chapter ends with eight discussion questions, but this simple study guide at the end of the book includes Bible references relevant to each question to "bring a satisfying and biblical closure" to group discussions. This would definitely be a lifesaver for my group. I think one of the biggest obstacles to studying the Bible, those words written so long ago, is that it's hard to see the relevance to our lives today. It's easy for us to dismiss the stories of the Bible as things that happened a long time ago, and we don't really see any connection to what's going on in our lives. It's hard to relate to the people and stories of the Bible, and that makes it hard for us to understand. In Bad Girls of the Bible, Liz Curtis Higgs has artfully bridged the gap for us. Each of these women's stories was included in the Bible for a reason. Through Liz's words, the stories come to life, and it becomes clear that each of these women has something important and beautiful to teach us: about sin, about forgiveness, about redemtion, faith, grace, and love. In preparation for our trip to a working farm in a few weeks, we've been creating our own farm animals from handprints! Enjoy! The cow and ducks are from Handprint and Footprint Art. So, so cute, doncha think? The sheep is from a craft book. There are so many great ideas on Handprint and Footprint Art--I think it would be neat to make one footprint or handprint animal with your child every month, or every quarter, and put them in a scrapbook, along with a picture of the child at that age. Wouldn't that be a nifty keepsake? And, speaking of handprints, just in case you were wondering, here's what the Camp Scarlet kids were working on for their mamas (sure hope none of the mamas read this before they open their presents--that might ruin the surprise). I leave upon the wall. because I am so small. will surely fade from view. Somehow MC's den leader was able to convince the fire department that they wanted to let 4 crazy 2nd graders come take a look at their equipment. Two little brothers came along, too. Why do other people's kids always want to jump into my family photos? I mean, really. How rude. So in this one, where I was trying to get a picture of 2 of my kiddos, I got only 1 of mine and 4 extras. At least we actually know these kids. And mine ended up in the middle. They made den leader Brian put on some, but not all, of the gear. Come on, Brian: we want to see you put it ALL on. This fire truck was state of the art when it was built in 1921! Yes, it still runs. In honor of my moms, GMary and Bev, and my sisters in motherhood, especially Sarah, Chip, Buckwheat, J, and Kiki: the following is an excerpt from The Invisible Woman: A Special Story for Mothers, by Nicole Johnson. Special thanks to Rocky for reminding me of this earlier in the week. God sees you, friends. Happy mom's day. Love you all! One day I was walking my son to school. I was holding his hand and we were about to cross the street when the crossing guard said to him, "Who is that with you, young fella?" Later, I would walk into a room and no one would notice. I would say something to my family - like "Turn the TV down, please" - and nothing would happen. Nobody would get up, or even make a move for the remote. I would stand there for a minute, and then I would say again, a little louder, "Would someone turn the TV down?" Nothing. Just the other night my husband and I were out at a party. We'd been there for about three hours and I was ready to leave. I noticed he was talking to a friend from work. So I walked over, and when there was a break in the conversation, I whispered, "I'm ready to go when you are." He just kept right on talking. It all began to make sense, the blank stares, the lack of response, the way one of the kids will walk into the room while I'm on the phone and ask to be taken to the store. Inside I'm thinking, "Can't you see I'm on the phone?" Obviously not. No one can see if I'm on the phone, or cooking, or sweeping the floor, or even standing on my head in the corner, because no one can see me at all. Some days I'm not a pair of hands; I'm not even a human being. I'm a clock to ask, "What time is it?" I'm a satellite guide to answer, "What number is the Disney Channel?" I'm a car to order, "Right around 5:30, please." She's going … she's going … she's gone! One night, a group of us were having dinner, celebrating the return of a friend from England. [Our friend] had just gotten back from a fabulous trip, and she was going on and on about the hotel she stayed in. I was sitting there, looking around at the others all put together so well. It was hard not to compare and feel sorry for myself as I looked down at my out-of-style dress; it was the only thing I could find that was clean. My unwashed hair was pulled up in a banana clip and I was afraid I could actually smell peanut butter in it. I was feeling pretty pathetic, when [she] turned to me with a beautifully wrapped package, and said, "I brought you this." It was a book on the great cathedrals of Europe. I wasn't exactly sure why she'd given it to me until I read her inscription: "With admiration for the greatness of what you are building when no one sees." I closed the book, feeling the missing piece fall into place. It was almost as if I heard God whispering to me, "I see you. I see the sacrifices you make every day, even when no one around you does. No act of kindness you've done, no sequin you've sewn on, no cupcake you've baked, is too small for me to notice and smile over. You are building a great cathedral, but you can't see right now what it will become." Code-man was Albert Einstein in his 5th grade concert, "Spaced Out." I tell ya, if I'm this much of a mess (that's right, I started bawling during his trio--wanna make somethin' of it?) this far away from the end of elementary school, it is not going to be pretty when he graduates from high school. My baby!...is going to middle school (!). I am SO not ready for this. Bubby learned to ride the 3-wheel scooter, just like "the brothers." Code-man's been practicing his Robin Hood skill set. He signed up for an archery day camp this summer. Bubby made a new friend, whose name is Squirmy Wormy. but we did find these two intermingling. I wish now that I had taken a picture of all of those 200+ wild creatures swarming the play equipment at the state park. It was truly an awesome and terrible sight, and I don't know if I will ever get the opportunity to see such a gathering again. That's it. Well, that's all I have pictures for...we're also in the process of setting a record for longest February (which, of course, is usually the shortest month of the year) ever--today was our 91st day of February in 2011. Yes, it was snowing AGAIN this morning, and we froze our tushies (and ears and hands) at Code-man's first soccer game of the season this evening.